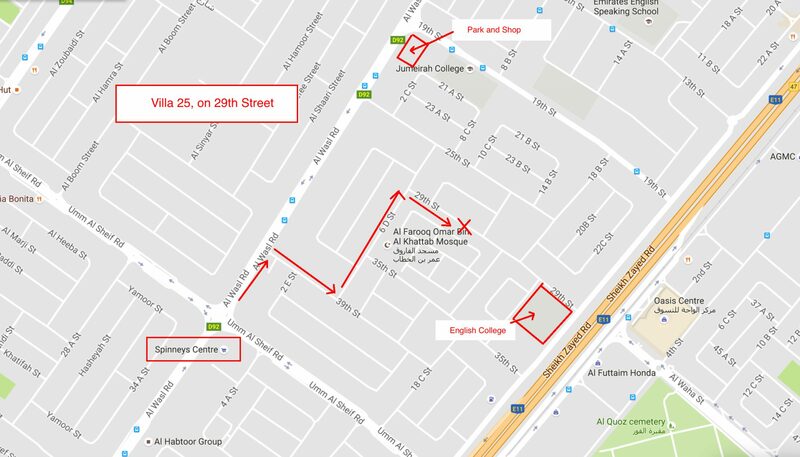 Directions: From Al Wasl Road, heading towards Dubai, pass Umm Suquiem Spinney’s on your right. Take the 1st right onto 39th Street then 1st left onto 6D Street. Take 2nd right onto 29th Street. Villa is about 300m down the road on your left. Villa number 25. From Al Wasl Road, heading towards Abu Dhabi, turn left at the traffic lights just before Park and Shop. Pass the schools and drive nearly to the end of the road and turn right onto 18B Street. Take 2nd right onto 29th street. Villa is about 200m down the road on your right. Villa number 25.